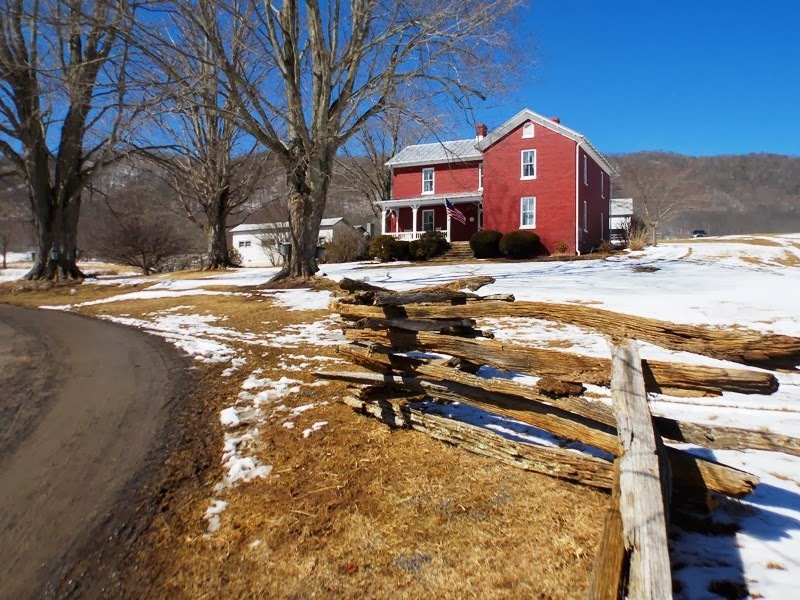 This is the 56th year of the Maple Festival held in Highland County, a celebration of the sugar maples that are prolific throughout this serenely beautiful western-most part of Virginia. Since the weather was great, we pointed our car west on the first day of the festival which presented an opportunity to stop at a familiar place and see familiar faces. Tim Duff (pictured above) is at home in the sugar house on his Fairlawn Farm south of Monterey. We've been visiting this twenty-year Coast Guard veteran since before he became sheriff of Highland County a few years ago. There a couple of reasons for that. 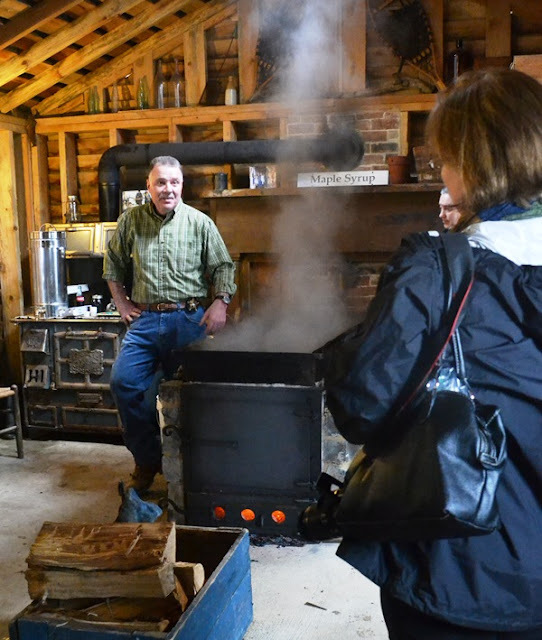 First, he demonstrates how to boil down sugar water to make maple syrup the old way. And second, he enjoys educating the public about the process that's all done with authentic equipment. The flat pan used for evaporation is 135 years old (I believe he said it's made of English tin), and other pieces of equipment are over a century old. Always willing to answer questions as he interacts with visitors who crowd inside his sugaring house, Tim is at ease in the familiar surroundings. In fact, he's downright jovial. This year was no exception. He was quick to credit neighboring farms for sharing sugar water since trees have not been as productive this year. Neighbors helping neighbors is the way it's done in Highland County. 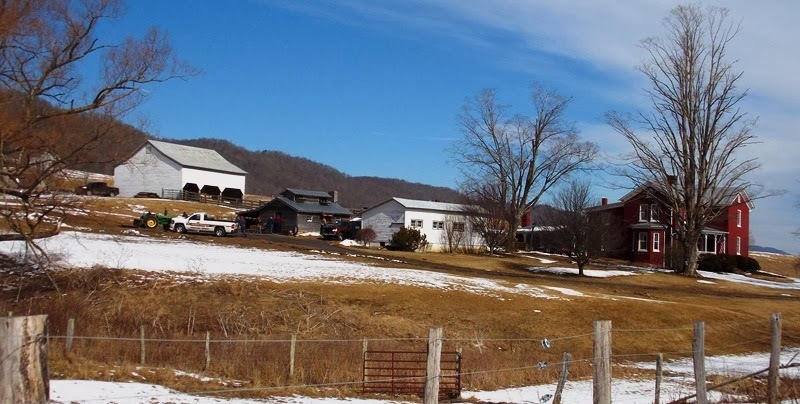 As in past years, a steady line of visitors parked on the road (the driveway was too muddy) and walked to the sugar house located between the white barn up on the hill and the smaller white building. 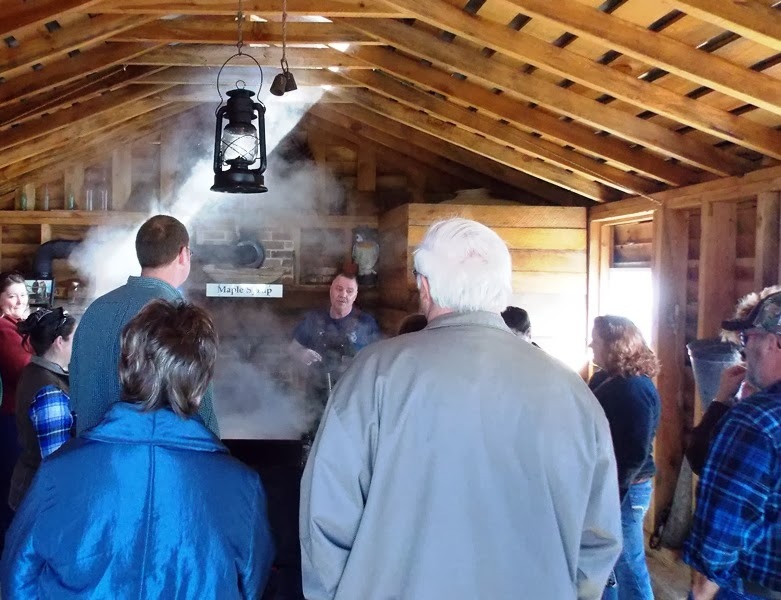 It's a family affair with wife Terry Duff outside selling syrup, their son Sean helping with syruping duties, and Tim bantering with folks inside the sugar house while sharing with them the historically traditional way of creating maple syrup. Labor-intensive and a process that takes two days to produce a small batch, Tim once described the end result as "liquid gold" to Bill Lohmann of the Richmond Times-Dispatch. Tim and Terry even tap the trees the old way complete with wooden spouts that are drilled into the trees and buckets with covers. The sap was running Saturday as temperatures warmed up to 50 degrees in the middle of the day. Standing beside a tapped tree in the quiet of Highland County, the steady drip-drip-drip of sugar water could be heard filling buckets. 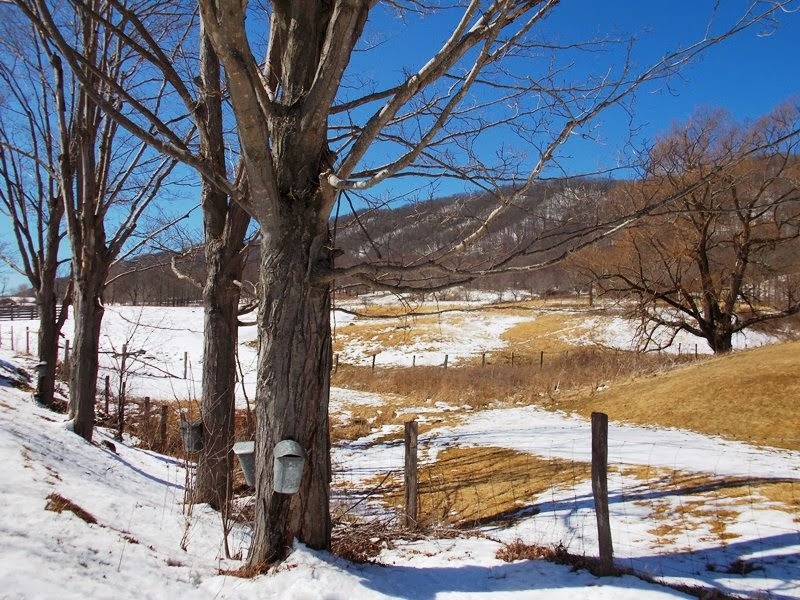 Sugar water production was down 75 percent this year, according to farm owners, because of the extremely cold winter of 2014 which made the sap slow to start running. "It might not start running until 4:00 in the afternoon and then would quit at 6:00 when the sun went down," I was told. Prices this year hitched up a bit, too, because of increased costs of bottling materials. 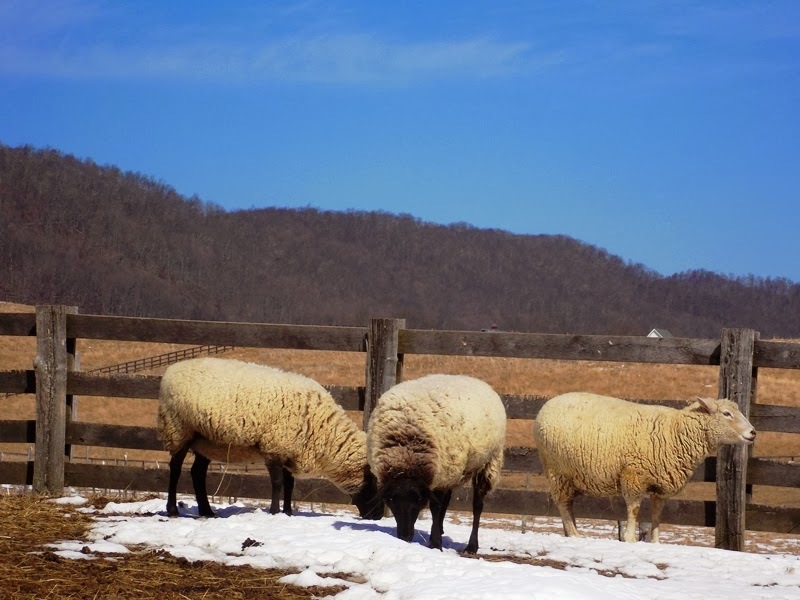 Sheep are everywhere in Virginia's "Little Switzerland" including these healthy-looking ones at Fairlawn Farm. We saw a few lambs while driving back roads but lambing season starts in earnest in a couple of weeks. Warm temperatures and melting snow are the makings of lots of mud so boots were in order as visitors trudged along in wet conditions that didn't dampen their enthusiasm for the event. 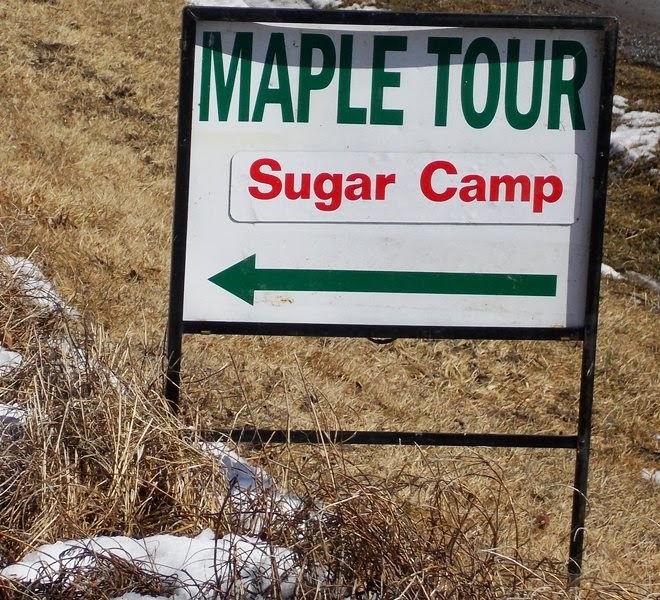 Watch for the Maple Tour signs at intersections throughout the county and they will guide you to one of the seven sugar camps. 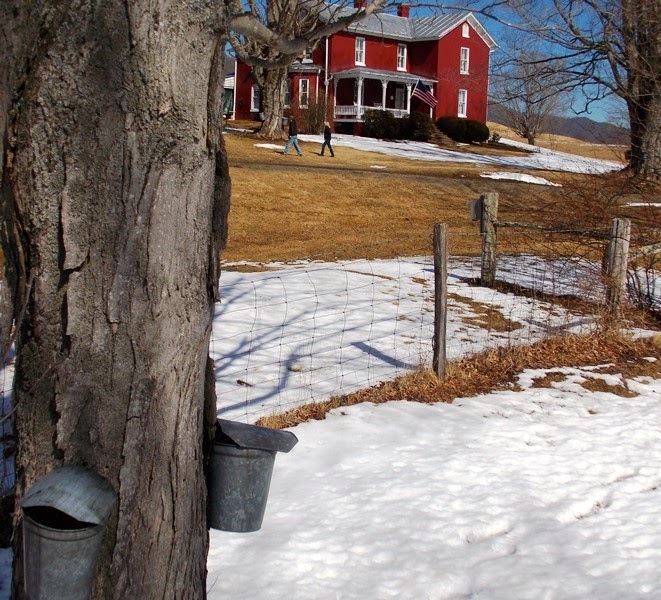 Some of the sugar maples at Fairlawn Farm are over 100 years old and are still used to continue the old-fashioned way of tapping the rising sap. That's the way Tim and Terry like it. Because they go about it the slower, traditional way, they make only about 35 gallons a season so if you're lucky enough to get some of Duff's syrup, you're lucky indeed. Our own liquid gold ... vintage 2014. Some people say it's too expensive to buy pure maple syrup. Yeah ... I used to think the same thing. And then I realized we were missing a unique opportunity by living so close to Highland County and syrup fresh from the trees. The taste is unlike anything bought in a supermarket, and each sugar house has its own special flavor. Duff's was charging $10 this year for this 12-ounce bottle of heaven, and it's well worth it. After watching Tim feed the fire with more wood, the sap boiled harder and steam engulfed him as he skimmed foam from the top. Every step during the process was carefully explained to visitors. During our stop, a lady who grew up in Pennsylvania on a farm that tapped trees and made syrup shared her experiences with Tim. It was interesting to hear their back-and-forth comparisons -- her remembrances from childhood and his experiences -- and how similar they were. 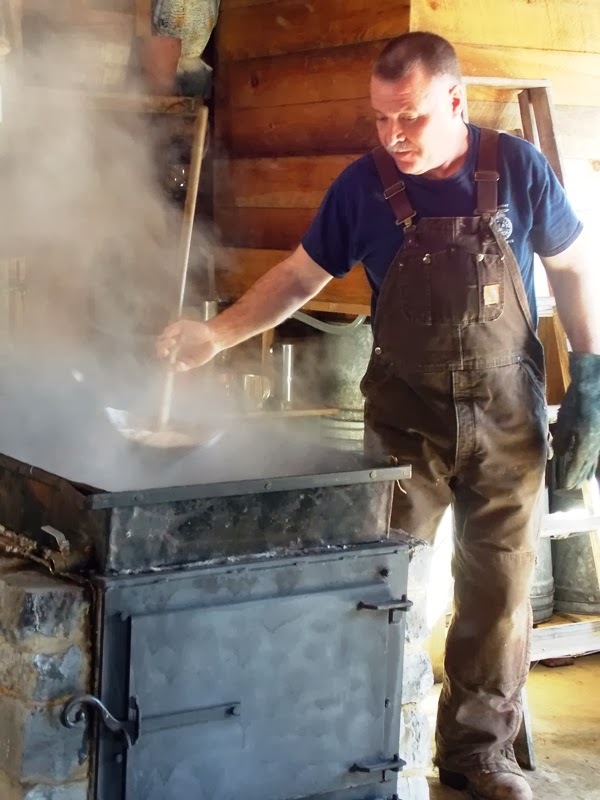 It takes 43 gallons of sugar water -- the locals just call it water -- to make one gallon of pure maple syrup. 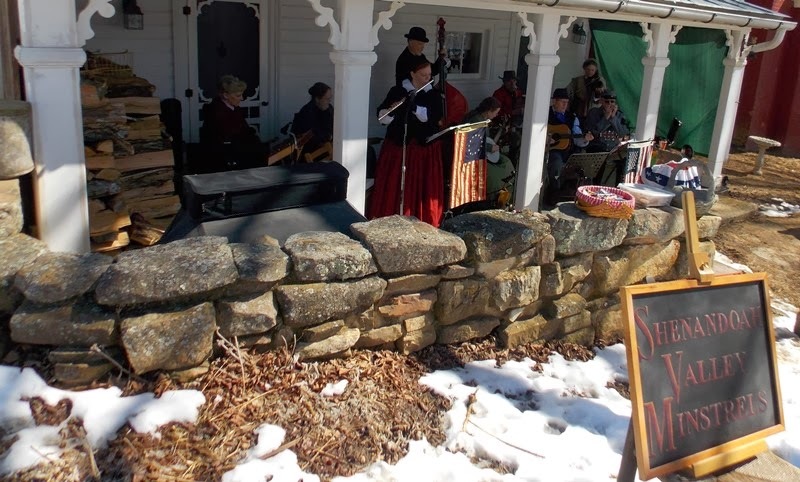 Entertainment by the Shenandoah Valley Minstrels on Sheriff Duff's side porch made for a toe-tapping good time the first day of the maple festival as nine costumed musicians played traditional music of the Civil War era. Talking with them revealed they were from "ten mountains over that way" (as they pointed east) and we assured them we were, too. They hail mostly from the northern Shenandoah Valley. I think Duff's is my favorite sugar camp for a specific reason: it is because of Tim's way of teaching, preserving, and passing on the old-time traditions. As a 16-year homeschool mom whose kids have now graduated from college and are productive adults in the business world, it was important to me during their growing-up years that they not only learn the new but also hear about and remember the old. Duff's was part of that learning process. This was a photo I took on March 16, 2013, at Duff's with my sister, who has been with me in past years. 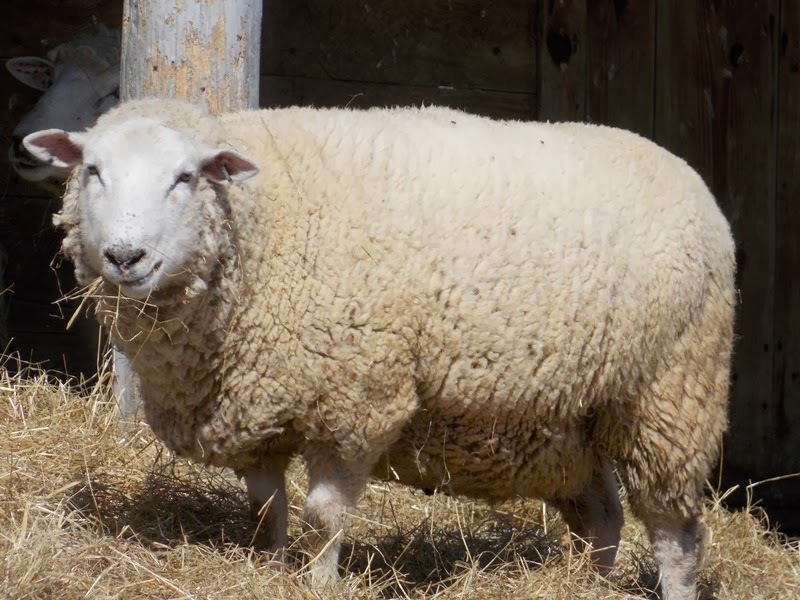 She is an educator in the Richmond area so she also enjoys visiting Fairlawn Farm. 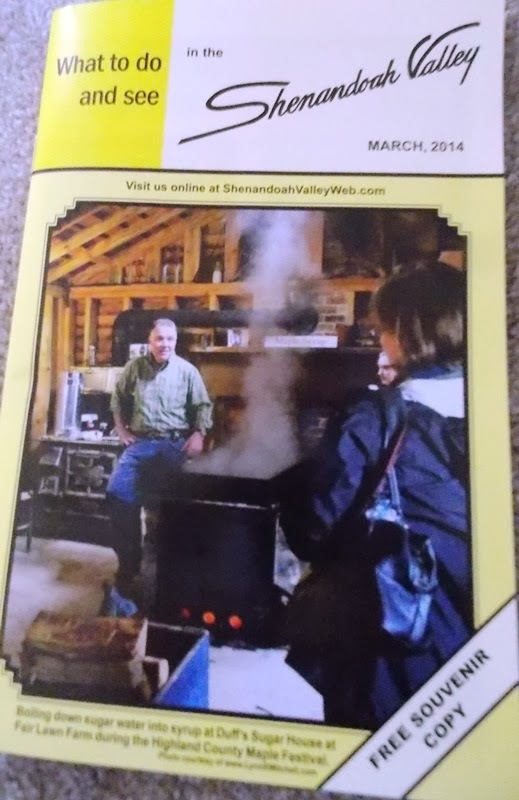 This photo is the cover of the March 2014 "Things to do and see in the Shenandoah Valley" magazine found at tourism spots throughout the area (thanks to Don Roadcap and Blue Ridge Press). Tim says after the tree is tapped, they hang a bucket, and that bucket has to be emptied every day. He does use gravity to transfer the sugar water to his holding tank and from there into the flat pan. Then the real work begins. "I've got a full 14 or 15 hour day ahead of me," he says. "All we do, we use gravity, it simply drips in the back of the pan, we keep the fire going, we cook it for a minimum of 12 to 14 hours. I'll get up tomorrow morning about 4 o'clock; the pan will be cooler than it is now obviously. We drain off everything, it will be about 24 to 28 gallons of really dark liquid, if not syrup - it's just darn close to being syrup." "Then we transfer it to the iron kettle. And that iron kettle, that is an original sugar kettle, it dates to 1885. We fill it up, if I can start that fire by 5 in the morning, by 11:30 12 o'clock I'm pulling off about 4 to 5 gallons of really good syrup. " Tim says he collects the syrup in a milk can and lets it cool for 24 hours. Then it goes into a big stock pot in the house for the final step: clarifying. "We'll take one or two eggs, a little bit of milk, whisk it altogether like you're making an omelet, and we pour this cold egg mixture into the cold syrup," says Duff. "Whisk it in real good so that it disappears, bring your temperature up because you have to boil this stuff to temperature because you have to bottle it hot. As you're boiling the syrup and getting off that last little bit of moisture you don't want in the syrup, the egg cooks. When the egg cooks, it solidifies, it floats to the top, and it brings up any wood ash, any dust, anything you don't want in your syrup is being sucked up by the egg. Skim it off, and you've got some of the clearest syrup you can imagine." Tim says that he is the smallest commercial producer in Highland County. The larger house will do in an hour what it takes him seven or eight weeks to do. He only makes about 35 gallons a season. 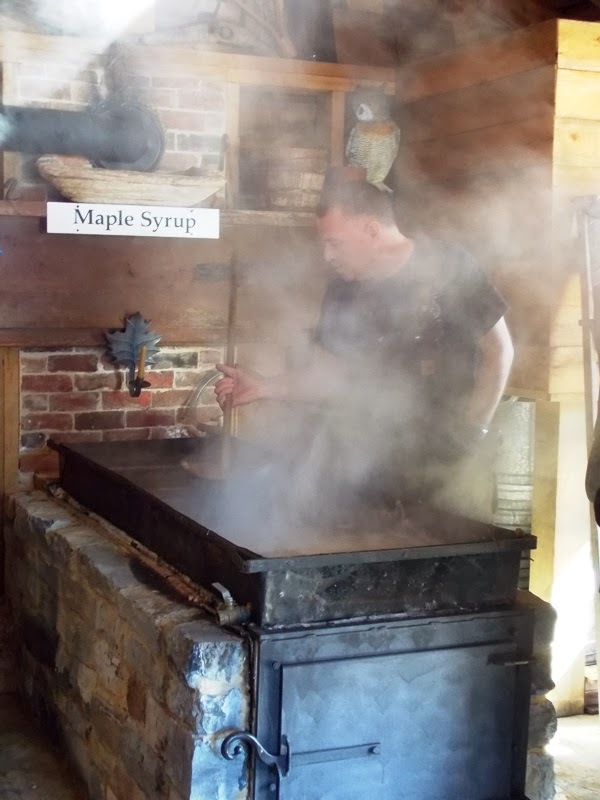 He says he doesn't make syrup to make syrup but rather to show people how it used to be done. And he worries about the future of his style of production. "Unfortunately, I would say in two or three generations, you won't see flat pans," he laments. "You certainly won't be seeing kettles being used. We'll be doing here as long as I can still make syrup." 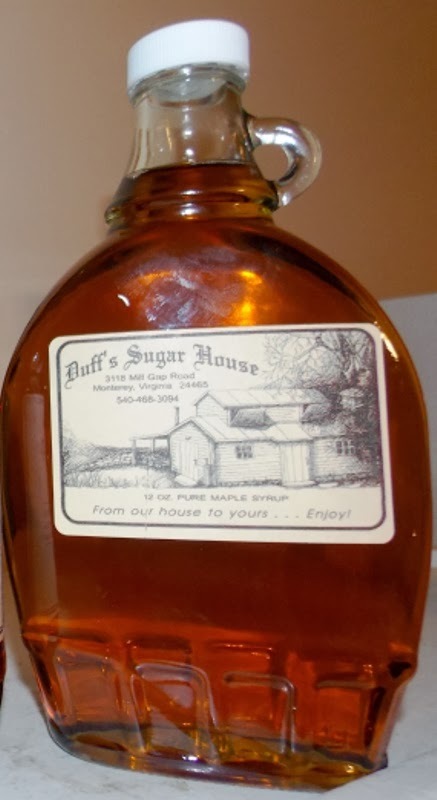 Duffs Sugar House is located on Route 84 just north of Mill Gap at Fairview Farms and is open for tours during the Maple Festival.